Afghanistan, Albania, Algeria, American Samoa, Andorra, Armenia, Aruba, Austria, Azerbaijan. Belarus, Belgium, Benin, Bhutan, Bosnia and Herzegovina, Bulgaria, Burkina Faso, Burundi. Cameroon, CapeVerde, Central African Republic, Chad, Comoros, Congo, Cote d'Ivoire, Croatia, Czech Republic. Denmark, Democratic People's Republic of Korea, Djibouti. Egypt, Equatorial Guinea, Estonia, Ethiopia. Faroe Islands, Finland, France, French Guiana. Georgia, Germany, Greece, Greenland, Guadeloupe, Guinea. Lao People's Democratic Republic, Latvia, Liberia, Libya, Lithuania, Luxembourg. Macau, Macedonia, Madagascar, Mali, Martinique ,Moldova, Monaco, Mongolia, Montenegro, Morocco, Mozambique, Myanmar. Netherlands, Netherlands Antilles, New Caledonia, Niger, Norway. Reunion, Romania, Republic of Korea, Russia. Saint Martin, SaintVincent and the Grenadines, San Marino, Sao Tome and Principe, Senegal ,Serbia, Slovakia, Slovenia, Spain, Suriname, Sweden, Syrian Arab Republic. Tajikistan, Thailand, Timor-Leste, Tunisia, Turkey, Turkmenistan. 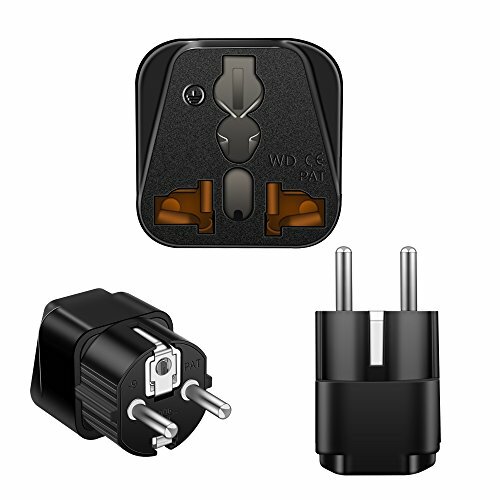 The Power Plug Adapter of Type E/F electrical plug (also known as a Schuko plug) has two 4.8 mm round pins spaced 19 mm apart. It is similar to the Type E plug but has two earth clips on the side rather than a female earth contact. The CEE 7/7 plug was developed to work with sockets E and F and has grounding clips on both sides (to work with Type F sockets) and a female contact (to accept the grounding pin of the type E socket). The Type E plug has a rounded shape and the Type E socket has a round recess.